According to Variety, Willem Dafoe has joined the cast of Disney’s John Carter of Mars, which already includes Taylor Kitsch and Lynn Collins. In the film, which is being directed by Wall-E helmer Andrew Stanton, Dafoe will play Tars Tarkas, a fierce green Martian warrior, who’s unusual among his savage race for his ability to feel compassion and empathy. In the film, which is based on the first of Edgar Rice Burroughs Mars novels A Princess of Mars, Tars develops an alliance with John Carter after Carter, a Civil War veteran, is miraculously transported, via astral projection, to Mars. Once there, Carter meets Martian princess Dejah Thoris, wins her hand, rediscovers his own humanity after the ravages of war, teams up with Tars Tarkas and eventually becomes Warlord of Mars. And did I mention that Tars Tarkas is also about eight or ten feet tall with four arms and green skin? At least he’s that way in the book. Fortunately, this isn’t the first time Dafoe has been green in a film, so it shouldn’t be too much trouble for him. The real question is how will he play someone with four arms who’s that tall? Of course, he’s a very good actor, so I’ll bet he can pull it off — with a little help from some movie magic. The Pull List Comic Reviews: ‘Captain America’, ‘G.I. Joe’, and More! For last week’s Pull of the Week and more, click here and here! Talk about promotional timing. This month, Captain America gets it’s 50th issue. Next month, Marvel lets the series go back to its original numbering and gives Cap his 600th issue. 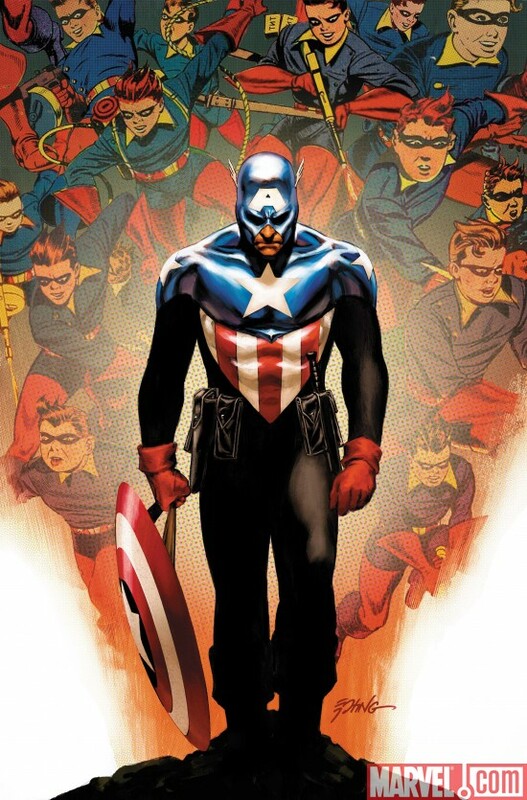 So what does writer Ed Brubaker bring to the 50th issue of Marvel’s Sentinel of Liberty? A birthday issue. The pages open with a dramatic action sequence from Penciler Luke Ross with Bucky being chased down the street by three heavily armed high-tech equipped villains. Bucky talks about how this birthday for him is just any other as he is doing what he has seemingly done on every birthday he can remember… fight. As Bucky continues his confrontation, he takes the reader back to his memories of various birthdays like the bar-room brawl he encountered at sixteen, fighting alongside the Invaders at eighteen and interrogating a Nazi with Steve Rogers, his idol and partner, on his twentieth birthday. He even fades back to a few brief memories as his time as the Winter Soldier where he didn’t even experience his birthdays anymore. As Bucky remembers his past while dealing with his present danger, he must contend with something that will forever haunt him, something he cannot argue. Bucky knows he is not the real Captain America. No matter how much good he does for the world or how many people he helps to make up for his past, he will never be Steve Rogers.